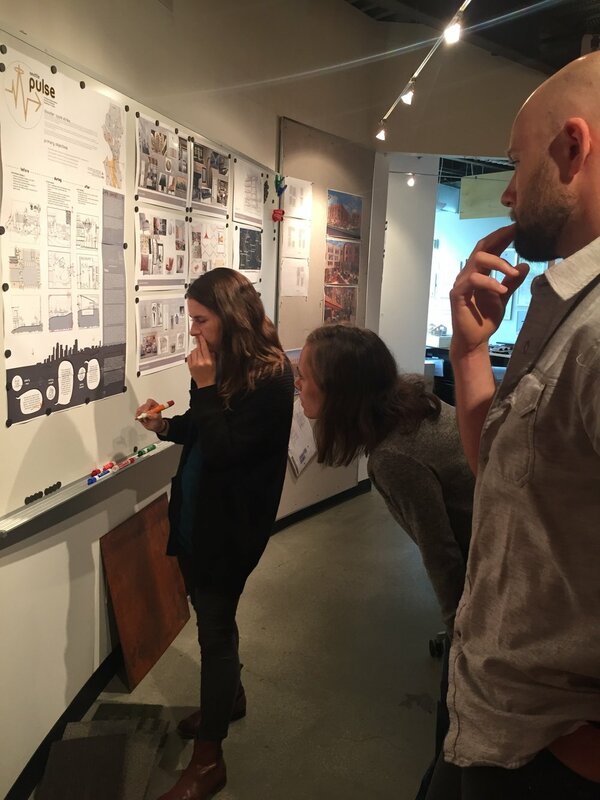 On September 10th and 11th, Architects Without Boarders Seattle hosted the Ready to Rumble competition focused on bringing earthquake preparedness to Seattle, and JA was pleased to get an honorable mention for our entry. We envisioned a three-pronged solution that would foster awareness before a quake, lead people to safety during, and provide shelter for displaced persons in the immediate aftermath. We found inspiration in multiple different disciplines ranging from art to agriculture. By utilizing different multi-sensory techniques and education efforts, our proposal sought to reach as many people as possible. By incorporating wayfinding devices as public art, we sought to weave earthquake preparedness into the very fabric of the city. We also incorporated gardening programs at school that not only had a wide array of education benefits for kids, but also would help produce some of the resources necessary in the aftermath of an earthquake. This focus on resources also led to one of our more inventive ideas: a self-inflatable high-altitude wind turbine that would be automatically released once an earthquake reached a pre-determined strength. These turbines would do triple duty, not only providing power for the Pulse Point communication hubs and Safe Haven shelters, but also assisting communication by acting as a transmitter for wireless communication, and with wayfinding due to lights placed along the tether. Beyond various artistic and scientific disciplines, we also looked to the unique geography of the city itself to inform out solution. Because Seattle is surrounded by Puget Sound on one side and the Cascade Mountains on the other, a natural disaster such as an earthquake can easily cut it off from the rest of the country for up to two weeks. Our gardening and wind-power initiatives would allow the city a larger degree of self-sufficiency while we await governmental aid. It was the knowledge that it could take up to fourteen days for the National Guard to reach us due to our natural barriers that led us to include Safe Havens that could shelter people during that time frame. The Safe Havens, as well as the Pulse Points, are all located where people gather naturally – parks and schools. The former in areas away from structures that could cause falling debris during a quake and that later in buildings that have been retrofit to survive an earthquake. It was this desire to channel people’s natural behavior, and to reach as many people as possible, that informed many of our decisions. We wanted each element of our solution to be as intuitive as possible. Major intersections and high-risk areas in subdivisions would have Wayfinding Signals. By placing Safe Havens in schools, kids would naturally be protected, and parents would be able to easily find their children if an earthquake struck during the day. Aware that earthquakes could strike at any time of day, we incorporated multi-sensory aids to help people find safety. By placing lights along the tether of the Pulse Point wind-turbines, people are able to locate safety even at night or in inclement weather. Light is also a part of our Wayfinding Signal, as well as sounds and texture. This expands the signals’ reach to the differently abled. While the sounds produced are English directions to safety, the symbol itself points in the direction to the nearest Pulse Point, that way even those who don’t speak English, or those who are unfamiliar with the city, could find their way to safety as well. Although designed to work in tandem with the pre-existing disaster relief models in Seattle, our earthquake relief plan could be easily adapted for other disasters and other locations. It is our hope that adoption of our plan would not only raise awareness of the risk of earthquakes in western Washington, but that seeing each element would inspire other locales to look at new, comprehensive solutions to disaster relief.